A company that is owed by its customers can use invoice factoring to borrow money. With factoring, the loan is secured against a customer’s invoice. When the customer pays the invoice, the loan is paid off, along with any outstanding interest or fees for the loan. It is one of the fastest and simplest ways for companies to borrow money. Here is an example to help you to understand how invoice factoring could potentially be used by your company. Let us say that you raise an invoice for a customer for £1,800. At Invoice Finance Scotland, we will lend you up to 90% of the value of that invoice. This means that you could potentially borrow £1,620 against it. The customer pays their invoice to us. At which point we take out the £1,620 lent, our interest and fees and pay the balance of the £1,800 to you. The factoring firm is responsible for making sure that the invoice is paid. For this reason, when the invoice is sent to your customer it is accompanied by a notice of assignment. This notice tells them whom they need to pay that particular invoice to. However, understandably, not all firms want their customers to know they are using a factoring company. For this reason, if the borrowing firm asks, the lender will identify itself as a money management company, rather than as a factoring company. This is known as confidential factoring. Many firms like this approach. It means they do not have to worry about chasing payment of the invoices they have borrowed against. That is all done for them by the factoring provider, which frees up valuable time for companies, allowing them to work on their core business and secure new orders. Borrowing money in this way is extremely easy. It can substantially speed up cash flow as well, which for most companies is extremely important. You can borrow against one invoice, a string of invoices or all of your invoices. 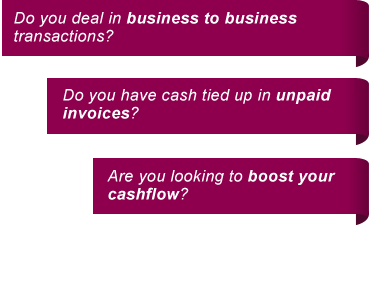 You can borrow against invoices raised against just one or all of your customers, the choice is yours. You are in control of how much you borrow against each and how often you borrow in this way. Virtually any size or type of firm can use factoring to raise the funds needed to finance a big project or to get through a slow patch. The credit history of the firm borrowing the money is less important than it is with other kinds of financing. There are several different kinds of factoring services available. If you are concerned about what would happen if your customer does not pay their invoice, you could consider recourse factoring. With this system, bad debt protection is included. Naturally, this service costs slightly more, but is well worth considering. Some firms’ customers are not UK based. However, they can still borrow money using export invoice factoring.